As we grow and share the BBQ love, so too does word of us. And whether it's something we're doing (Check out our Youtube channel here) or something somebody else is doing, we think it's pretty awesome. So come here for all the latest and greatest. A discussion on how Melissa moved from school teacher to BBQ owner and the planning and obstacles that showed up for her and Martin on this journey. "A little slice of South Georgia on the Mornington Peninsula"
"Smoked meats and housemade BBQ sauce? 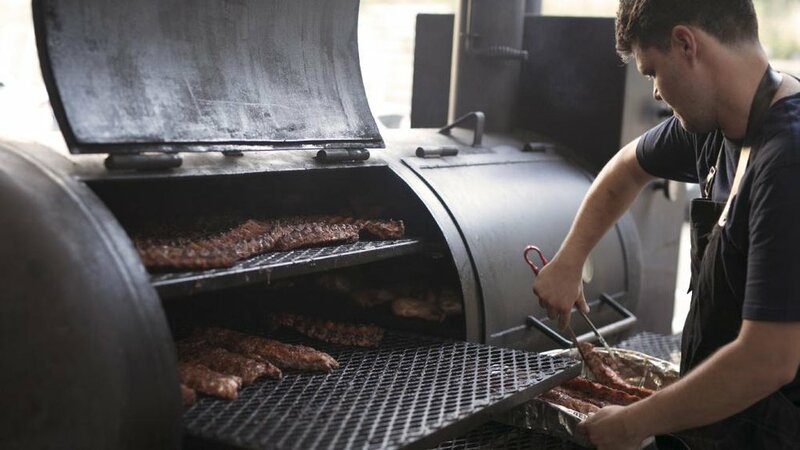 Hells yeah"
"Unassumingly tucked away in what was once a mechanic's workshop, husband and wife team Melissa and Martin serve seriously amazing American BBQ." Red Gum BBQ: "...get ready to roll up your sleeves and pile a tray with meat that falls off the bone, mac ‘n’ cheese, crunchy pickles, golden cornbread, creamy slaw and broccoli salad, in which even the mayonnaise is homemade"
"Red Gum BBQ is set up for families and socialising with craft beers on tap, an open pit room, indoor and outdoor dining, and an aroma that is mouth-watering the moment you walk through the door." "That is, until you take a seat at one of the long, wooden tables inside Melissa and Martin’s Red Gum BBQ in Red Hill and tuck into a St Louis-style spare rib. Or a thick slice of brisket. Or a tray of pulled pork. And leave room for the banana pudding." "The meat itself is free-range pork or grass-fed cattle of the highest quality...It’s southern comfort food"
Mosey Peninsula. 16 October 2017. Max Plus Food. 21 August 2017. Model Turned Cook. 16 August 2017. Miss Morni Penni. 18 March 2017.